Yahoo began as Yahoo by forming web directories, typically referred to as the first search engine - although human powered search engine. Yahoo began closing several European Directories late last year, including the directories in France, Germany, Italy and Spain. Next month, on November 8, 2010, Yahoo is closing the UK directory. I reported this at Search Engine Land last week, via a hat tip from Martin Forshaw but didn't see any threads in the SEO community about the change. Just wanted to let everyone know that I recived a message yesterday from Yahoo saying that .co.uk Yahoo directory is closing and moving all exisiting listings to USA directory. They are also happy to give all the refunds to everyone who wishes to terminate their listing. They are closing in November, so anyone wishing to get their £300 refunded should do it by mid of November. 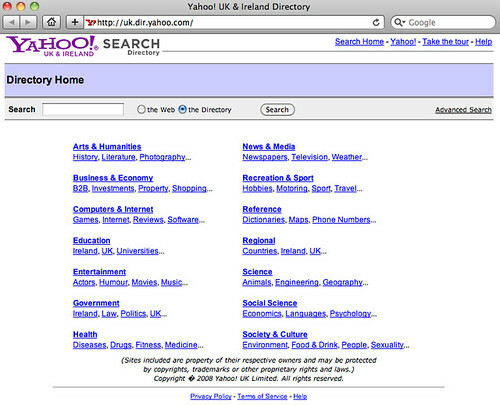 Here is a screen shot of the Yahoo UK Directory today, so that we can remember it when Yahoo takes it offline.